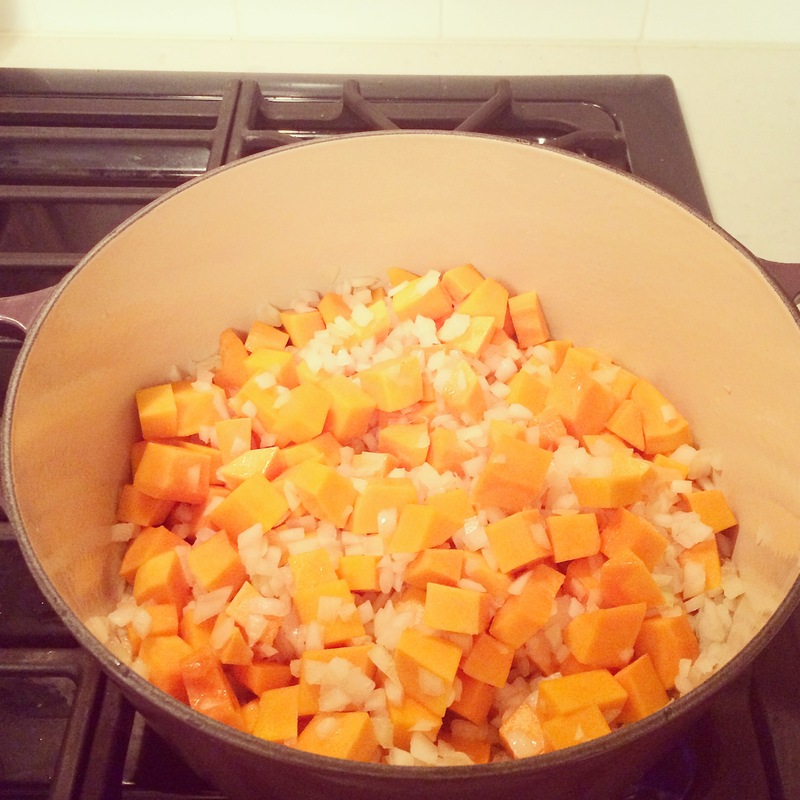 Fall is my favorite season for many reasons, but one of the big ones is of course that fall means soup season is here. If possible, I’m even more excited about soup season than I am about pumpkin season (and we know I’m pretty excited about pumpkin season). 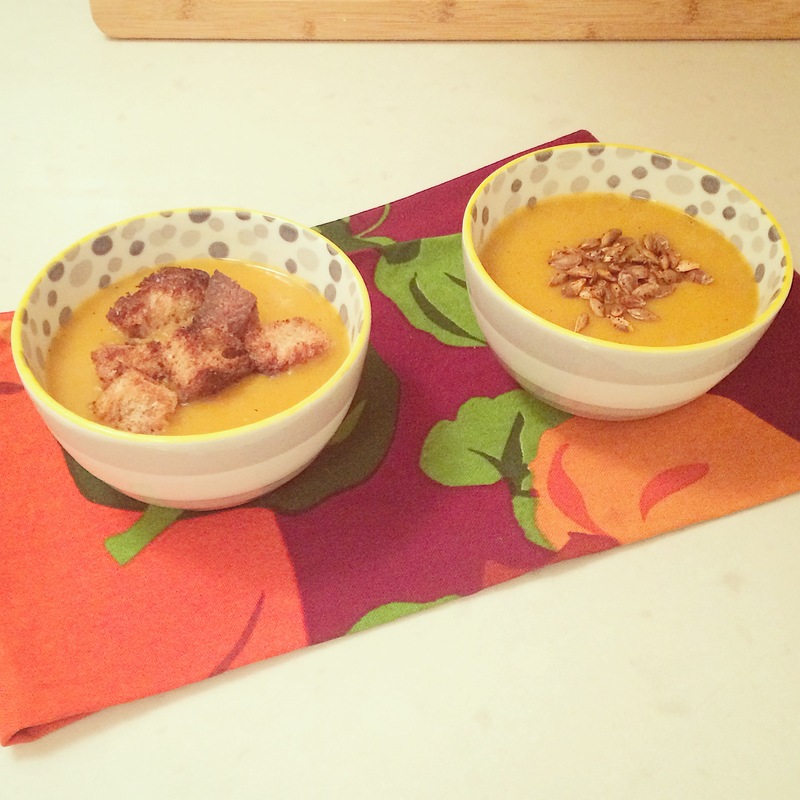 This soup makes a perfect weeknight dinner, as well as yummy leftovers for work week lunches. I found this recipe via a cooking show, and was pleasantly surprised at how simple and delicious it was. And the croutons and/or roasted squash seeds make it that much better (the best part about soup is that it can be a vehicle for so many fun toppings!). 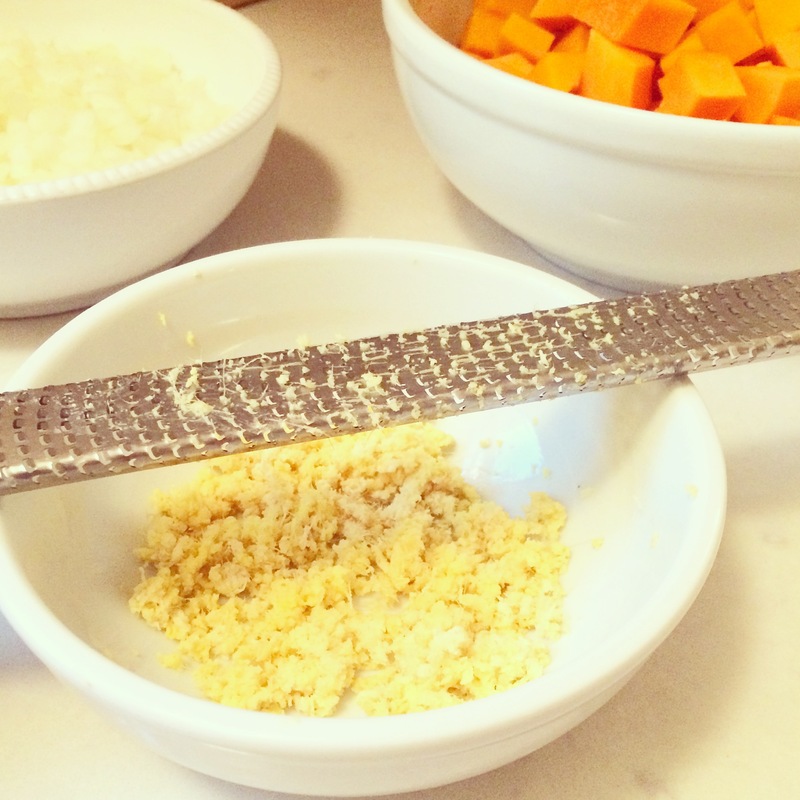 The only prep work you have to do is chop your squash, dice an onion, and grate some ginger. 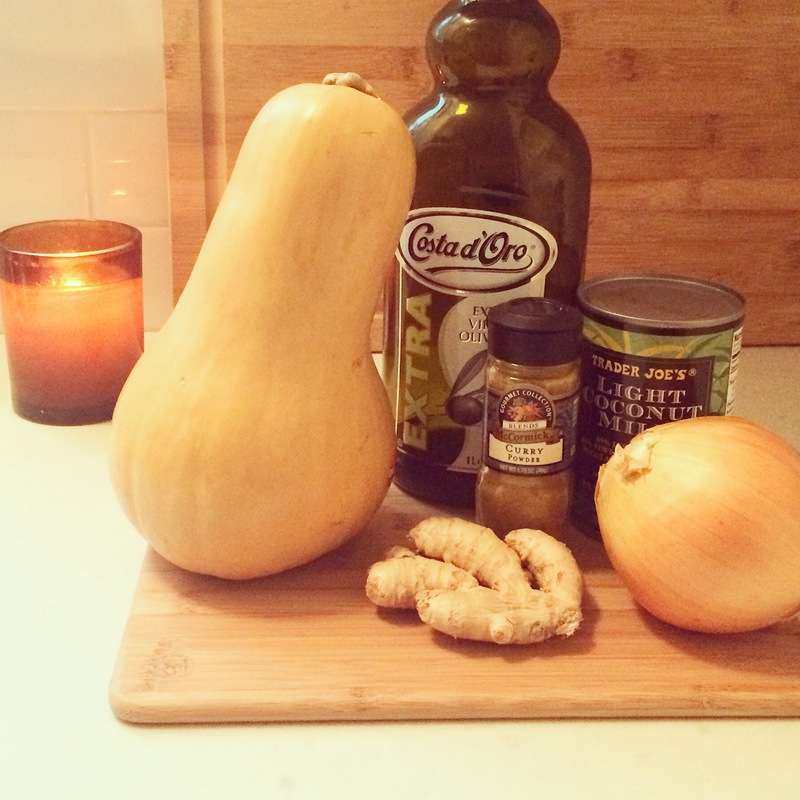 And of course you could always buy the pre-chopped squash if you wanted to save yourself some time, although I think you get better flavor if you start with a whole squash – plus that way you have seeds too. I have no problem with a pre-chopped onion, however. The recipe calls for one full can of coconut milk and one cup of water. And while it’s delicious when made that way, it’s pretty rich (and it would be so healthy but for the 700+ calories in that delicious little can). It also gets pretty thick once it cools. Now I usually make it with light coconut milk, and/or extra water. Soups, previously: White Bean and Kale, Split Pea, Cream of Fresh Tomato, Pumpkin Black Bean. Hard to believe this blog has been around for almost nine months, and this is only the fifth time I’ve posted a soup! I’m sure we’ll remedy that in the months to come. Coat the bottom of a large soup pot or Dutch oven with olive oil. Add butter and melt over medium-high heat (you could omit the butter and just use a little more olive oil if you like). 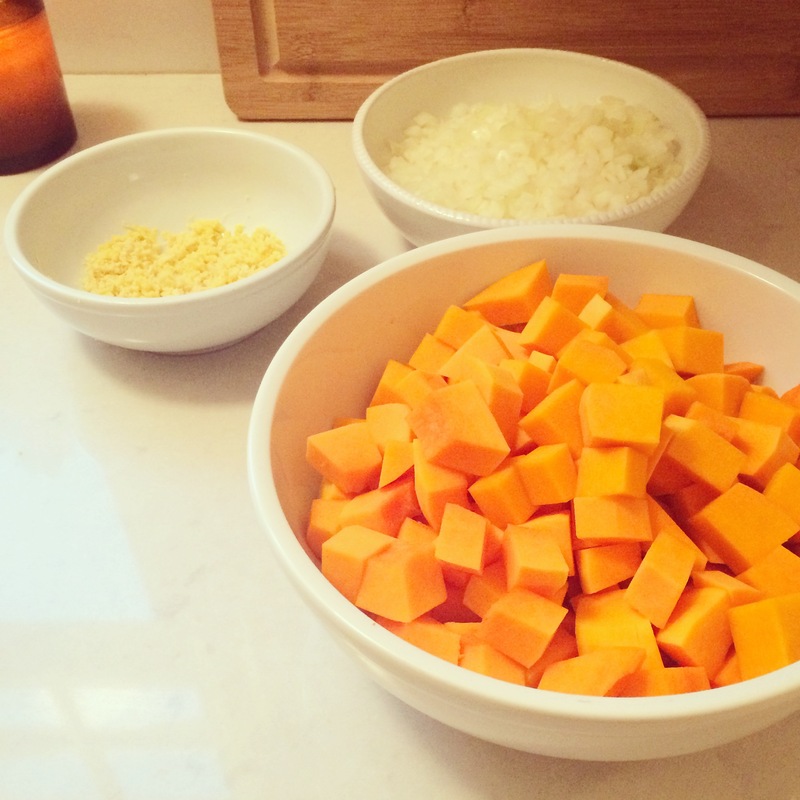 Add the butternut squash, onion, and a generous pinch of salt and cook until softened, 10-15 minutes. Add ginger and curry powder and cook for one minute longer. 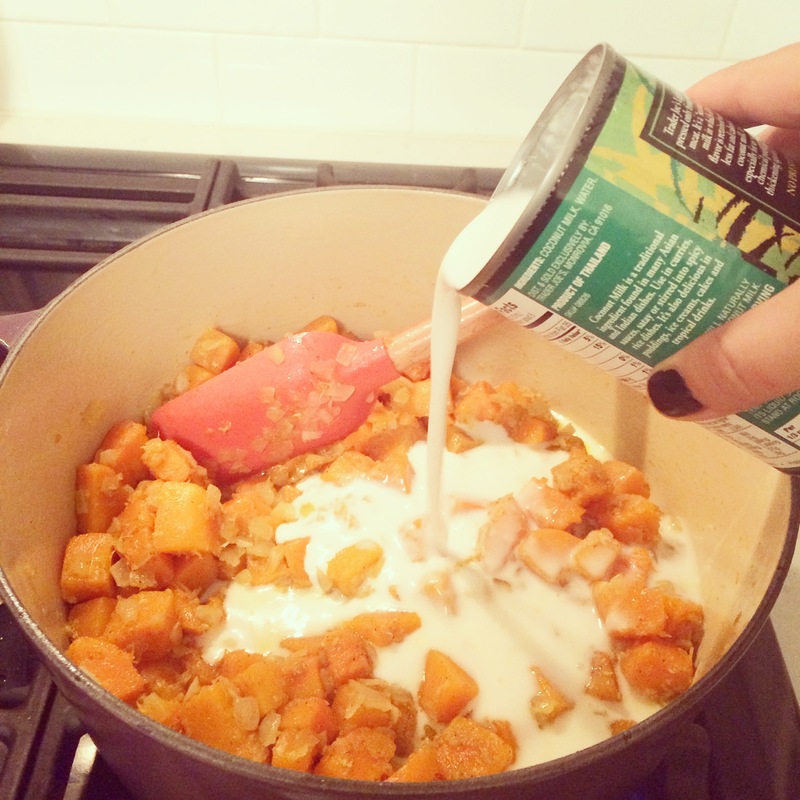 Add coconut milk and water and simmer until the squash is very soft, about 15 minutes. Purée with an immersion blender and season with salt and pepper to taste. Garnish with cilantro leaves, a lime wedge, a dollop of Greek yogurt, and/or one of the delicious crunchy toppings below. 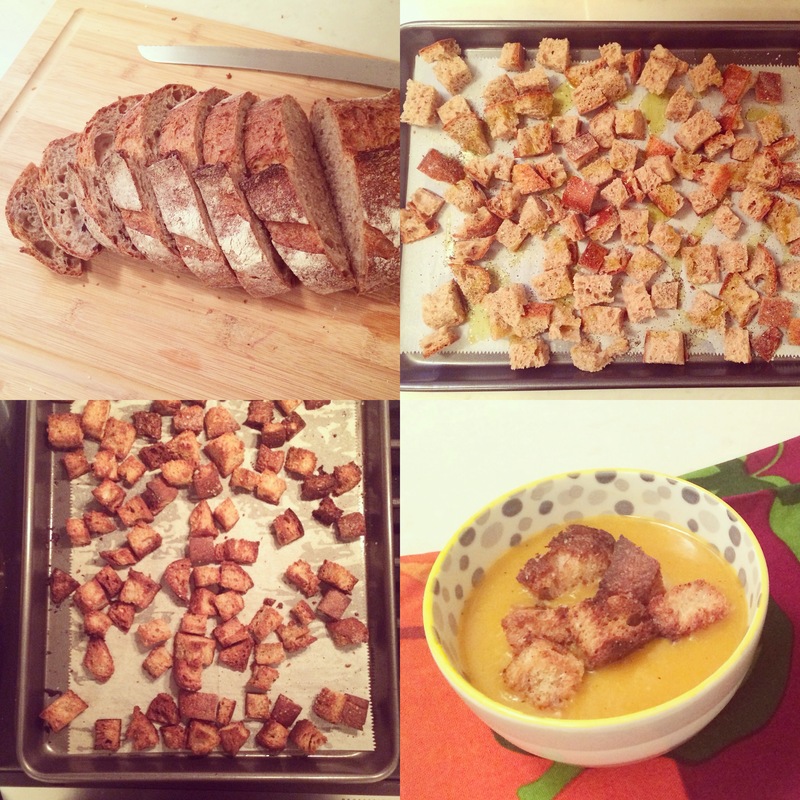 Cut a loaf of bread into cubes (this is a great way to use up leftover baguette). Toss the cubed bread on a rimmed baking sheet or jelly roll pan with a drizzle of olive oil and a sprinkle of sea salt and cracked black pepper. 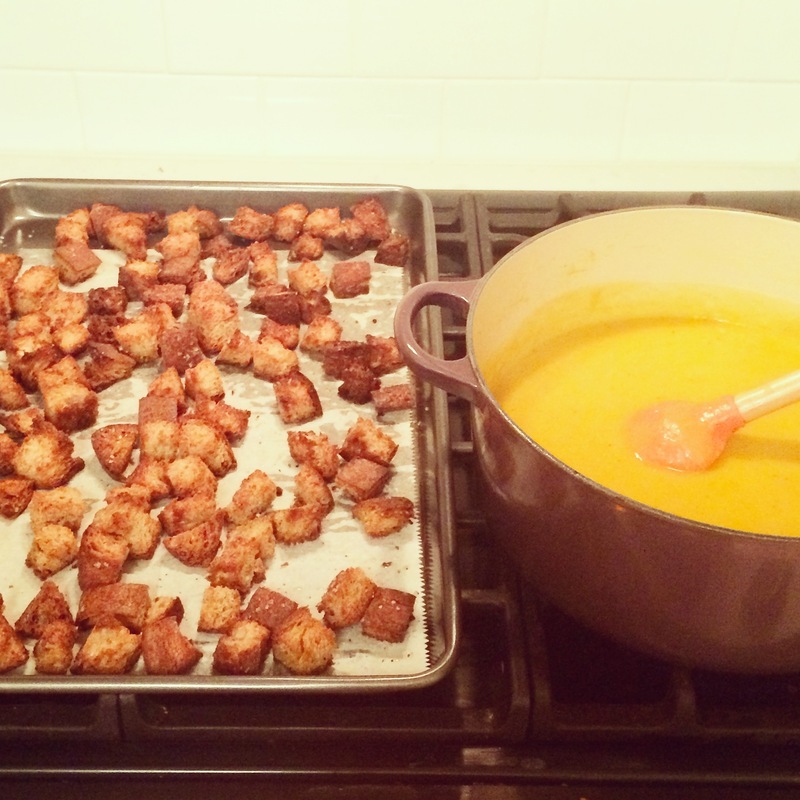 Bake at 400 degrees for about 20 minutes, stirring once or twice so that the croutons brown evenly. Stored in an airtight container or ziplock bag, these will keep for a couple weeks (if you don’t snack on them like I do). 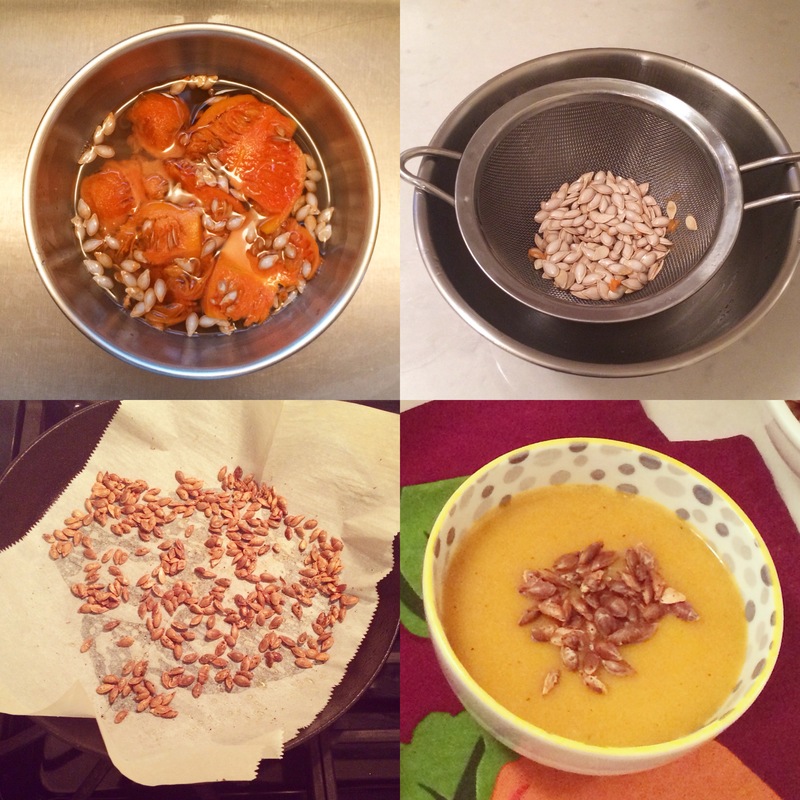 My new trick for squash seeds is to separate them from the squash flesh like pomegranate seeds – submerge the seedy flesh in water, then use your fingers to pull the seeds out – then drain. So quick and easy! Dry your seeds and then toss with a small amount of olive oil, salt, and pepper (you could also add some curry powder here, or any other spices you like). Roast at 400 degrees for 15-20 minutes, stirring frequently so they don’t burn.